Welcome to the POITOU BIERE FESTIVAL ! We are de-lighted to announce that the second POITOU BIERE FESTIVAL will start during the week-end of the 20th of April 2019 ! 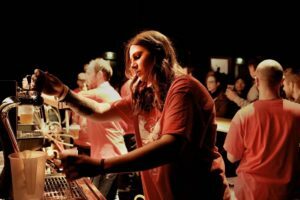 Last year, for the first edition, more than 1200 people attended the day-long event, featuring a massive range of craft beers from 22 different brewers from the local region, as well as elsewhere in France. Five leading international brewers also visited the festival: two Welsh, two from London, and one from Spain. The event is organised by the owners of the growing number of craft bars and local breweries in and around Poitiers. The aim of the festival is to help promote and develop the craft beer scene, interest in which has rocketed across France in recent years. The festival day was split into two parts. The DAYTIME SESSION ran from 11am-6pm with the chance to taste and discuss craft beer with all invited brewers, alongside tasting workshops, homebrewer displays, and food pairing activities. Then from 7pm, the evening session featured two giant bars serving a massive range of craft beer, plus two concerts, followed by two DJs taking everyone into the wee hours of Sunday morning. There was also a pop-up beershop, selling takeaway beers from all invited brewers. Three local food trucks were be present throughout the day (including vegetarian, gluten-free and vegan options), as well as an on-site canteen providing snacks and meals. 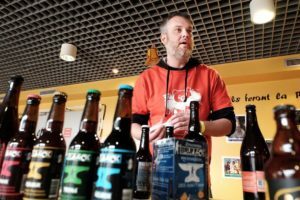 In addition to the main festival event, there was a three-day Fringe Festival (“OFF Festival”) on the Wednesday, Thursday and Friday, where 15 local bars and beershops hosted a programme of craft beer tastings, beer / food-paring events, homebrewer exchanges and tap takeovers. Please keep an eye on this website for details of the second Poitou Bière Festival to be held in 2019 !